Looking for cheap ticket on Megabus to Paris? Look no further. You can now get tickets to European destinations, including Boulogne, Paris, Brussels and Amsterdam from only £1. Yes. One pound. 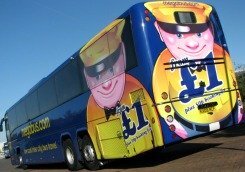 You can get a Megabus tickets here now, whether you are travelling from London Victoria coach station or Birmingham city or indeed any of the many UK destinations straight to Porte Maillot Coach park in Paris from between £1 to £40 on this no frill bus service. Like the regular inter-city service, there is an additional 50p booking fee. With such a low-cost service from the UK to Paris, you can be sure to save your hard earned cash on value-for money Paris deals. Whether you are a student traveling on a shoe string budget or just dash out on a weekend trip to see the Palace of Versailles, the Louvre Museum, the Arc de Triomphe, or on a Seine river cruise with friends or family, you can do this without breaking a bank. Thanks to Megabus. You can check to see if you can get to Paris on Megabus from any UK destination here. Travelling on Megabus to Paris no frill service comes with some convenience. It is certainly a good value for money several times over. With every bus to Paris, you get a modern coach, professionally driven with on-board toilets and Free wi-Fi for your internet browsing. There is also accessibility provision for the mobility impaired. What is more, Megabus always work to see that this standard coach seats brings comfort as much as possible. For a journey of 8 to 12 hours if you are travelling from London to Paris on Megabus on a fun and friendly environment, it is clearly a great value for money service by any standard. What if you could make your trip to Paris go even further by visiting up to 60 top Paris attractions hugely discounted. The Paris Sightseeing Pass makes that possible.